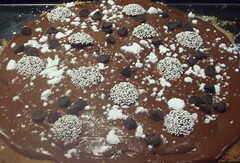 I am sorely tempted to serve Chocolate Pizza for dinner tonight, then right as the girls go to take a bite, whisk it away and replace it with something they don’t like. It sounds like such a fun joke to me! Thankfully for them, I am not so excited about April Fool’s Day that I would actually do anything that mean! BG tricked MG today by swapping the bags inside the (hooray! they are gluten-free!) Rice Chex for EnviroKidz Gorilla Munch, so when MG went to pour herself a bowl of her beloved Rice Chex, she got the not-beloved Gorilla Munch instead. That was really the extent of our April Fool’s Day pranking, thankfully. The girls think they pulled a fast one on me today, and got out of some schoolwork. In reality, though, they just enabled some wonderful teachable moments. In place of our pre-planned history and science lessons we went on a walk, since it’s the second day in a row of no rain! We went for a Nature Walk, and broughtNature Walk journal pages for their science notebooks. They had fun doing their Nature Walk journaling at the nearby duck pond! I now have some lovely portraits of the ducks and goose at the pond, who (of course!) now all have names. We had been looking at the plaques on nearby homes lately, so I created a template for our Historical Home Walk. Using this form we walked through the neighborhood noting the street number and name, year the home was built, who it was built for, the occupation of the person it was built for, and any further notes. In our town, and many others in the area, the plaques on older homes list this information on the side of the house. There are a lot, more than a half-dozen within a block of our home. Now we have a lot of local history and information about life in the 1700s and 1800s to research! I had no idea what a cordwainer did for a living, do you? Well a nearby house was built in 1848 for a cordwainer, and now we know what his job was. Another nearby home was first built as a chapel in 1818, then adapted into a home almost 70 years later. It’s all fascinating, and our walk (which got them out of a pre-planned lesson) combined history, science, language arts, drawing, and physical education! We’re really looking forward to going down other streets the next day it isn’t raining. As a bonus, we took my birthday present, a TomTom ONE XL, on our Nature and Historical Homes walk with us. Just in case we got lost, of course. We want to be safe, so it’s a good idea to make sure you know how to find your home! We’re thrilled it comes with a “walkable route” option.